Timing is one of the cornerstones of The Step Up Diet and a healthy lifestyle. Make it your family’s priority this June to eat only at mealtimes such as lunch and dinner, especially since children and adults alike tend to snack in between. 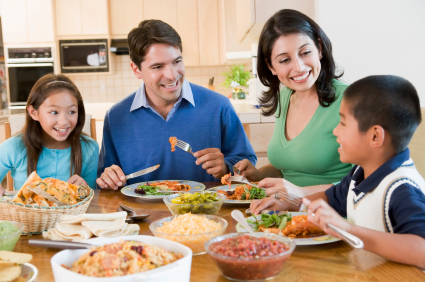 By eating at only at mealtimes, your family will be hungry enough to enjoy a home-cooked meal. Hopefully, the kids won’t complain when they aren’t hungry anymore! You should eat only at meal time: breakfast, lunch, fruit as an afternoon snack, and dinner. The goal is to let your child’s digestive system rest for 3-4 hours in between meals. During those hours, urge them not to eat anything – simply drink water when he or she becomes thirsty. Push family dinners to times after 7pm in order to maintain 3-4 hours eating schedule after an afternoon fruit snack. A Harvard University study published in the Archives of Family Medicine found that families who ate together, almost every day, generally consumed more vital nutrients like calcium, fiber, iron, vitamins B6 and B12, C and E, and less overall fat than families who rarely ate together. During adolescence, family meals also contribute to higher daily intakes of fruit, vegetables, calcium and other key nutrients, and lower intakes of soft drinks. Easy to follow in the long run – All offices, schools and colleges give people time to have breakfast, lunch and dinner. There are also those who don’t feel like eating first thing in the morning, and generally do not feel like eating till lunch. If this is the case, keep in mind that breakfast does not have be eaten immediately upon waking up. You can eat your breakfast even a couple of hours after waking up but there’s no need to miss breakfast altogether. Allows you to eat bigger meals – This is where six meals a day becomes a problem for family members that love to eat big and are trying to lose weight. Six small meals never make adults or children feel like they’ve eaten a meal, therefore they always feel as if they are snacking. This makes the brain constantly crave a meal. Observe how your child eats and adjust their meals accordingly. Teaches you to control hunger – In most cases, eating six times a day tends to make adults and children eat more since they tend to mentally crave food every 2-3 hours whether they are actually hungry or not. So when adults and children decide to eat only three times a day, they slowly start to control their hunger better as they now go longer without food and develop better mental control. Healthy eating for the entire family doesn’t have to completely alter your current breakfast lunch and dinner schedule. Find the best ways to help your family adjust to mealtimes by following the Step Up Diet today.